Selecting the right life insurance product is often a tough task for insurance buyers because of the plethora of products offered by insurers, deliberate mis-selling of some products by certain insurance intermediaries and confusion about certain products. We have discussed in our previous insurance related articles that, term insurance is the purest form of insurance and should be the first choice for someone buying life insurance. Other insurance plans are hybrid insurance, savings and investment products. Endowment and Money Back plans are traditional insurance and savings products that have been very popular in India for a long time. While endowment and money back plans from Life Insurance Corporation of India (LIC) are most popular amongst insurance buyers, all other life insurers also have endowment and money back plans in their product mix. Although endowment and money back plans have been around for a long time, there is still confusion in the minds of a lot of insurance buyers about the returns and suitability of these plans. 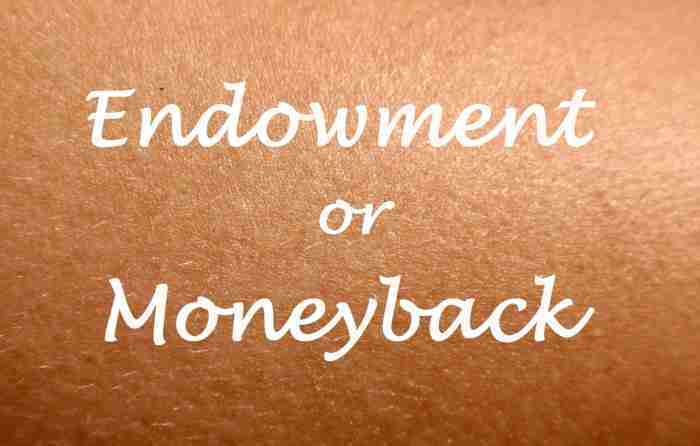 What is the basic difference between an endowment and money back plan? The key difference is in survival benefits. The endowment plans pays the money, which includes the sum assured (or cover) and bonus, on the maturity of the policy. Money back policy, on the other hand, returns money usually as a fixed percentage of the sum assured to the insured during the term of the policy at some regular frequency (e.g. 5 years). The balance sum assured and bonuses are paid on the maturity of the money back policy. In the event of a death claim, both endowment and money back plans pay the sum assured to the insured. Both endowment and money back plans are essentially savings products, in addition to life insurance. Money back plans are suitable for those insurance buyers, who need income from their insurance plans at a regular frequency to meet specific financial objectives. In addition to life insurance, the objective of buyers of endowment plan is primarily savings. Some insurance buyers think that, the return from money back plan is higher compared to endowment plans, since they are getting a part of the money well before the maturity of the policy. We will address this notion by objectively analysing the returns from endowment and money back plans. For our analysis, we have chosen two new plans from LIC, the New Endowment Plan (# 814) and the New 20 year Money Back Plan (# 820). We have assumed that the insured is 30 years old and wants a sum assured of Rs 10 lakhs. The policy term is assumed to be 20 years. The table below shows the comparison of premiums of these two plans. If the insured survives the maturity of the policy, he or she will get the sum insured and accrued bonus. We will discuss the different types of bonuses paid by LIC later in the article. The insured will get 20% of sum assured as money back after every 5 years. Therefore in the above example, with a sum assured of Rs 10 lakhs, the insured will get Rs 2 lakhs after 5 years, Rs 2 lakhs after 10 years and Rs 2 lakhs after 15 years. On the maturity of the policy, the insured will get the balance 40% of the sum assured and the accrued bonus. Generally when we speak about bonus of an endowment policy, essentially we are speaking about Simple Reversionary Bonus. It is usually declared every year as an amount per thousand of sum assured and accrues throughout the term of the policy. It is payable either on maturity or claim or surrender of the policy. If the policy holder surrenders the policy before completing the full policy term, he/she will not get the full bonus amount. LIC discloses the bonus amount every year. It is available on the LIC website. The most important thing to note about Simple Reversionary Bonus is that it does not compound, it only accumulates. This bonus is paid on certain policies which run for long duration (e.g. 15 years and above, as decided by LIC). This bonus is calculated at the time of maturity or claim. The LIC bonus document contains the information regarding the insurance plans that qualify for FAB, and the FAB amounts by duration and sum assured. This is loyalty bonus and is paid on certain policies policy holders who have been with LIC for a long time. This bonus is also calculated on per thousand sum assured basis. Usually Loyalty Additions are calculated at the end of the term. Since the New Endowment Plan (812) and the New Money Back Plan (820) are new plans launched by LIC this year, the bonus rates of these plans are yet to be declared. For the purpose of our analysis, we assumed the bonus rates for the New Endowment Plan and the New Money Back Plan to be the same as the other endowment and money back plans of LIC. The 2013 bonus rate for the LIC endowment plans was Rs 42 per thousand of sum assured and that of the money back plans was Rs 39 per thousand of sum assured. Final additional bonus for endowment plans was Rs 70 per thousand of sum assured and that of money back plans was Rs 30 per thousand of sum assured. The table below shows the maturity amounts and the total payouts from the New Endowment and Money Back Plans. In order to estimate the returns from these two plans we have to look at the cash flows for these two plans. Let us first look at the New Endowment Plan. The cash flow of this plan is straightforward. There are annual premium payments of Rs 47,617 every year during the policy term. On maturity of the policy, the insured gets the sum assured and the accrued bonuses, in total Rs 19,10,000. The table shows the cash flow from the endowment plan. Let us now look at the New Money Back Plan. The cash flow consists of annual premium payments, money back and the maturity amount. The premium amount every year, for the first 15 years, during the policy term is Rs 74,518. The insured gets Rs 200,000 money back during years 5, 10 and 15. On maturity the insured gets Rs 18,20,000. The table shows the cash flow from the money back plan. We have seen that the returns of endowment plans are not high. The returns of money back plans are even lower. However, money back plans have specific financial planning objectives. The objective of money back plans is to generate income at some regular intervals to meet some planned expenditure. Investors should make an evaluation of their financial plan before investing in either endowment or money back plans. In the next article, we will discuss how we can improve our returns from money back plans by re-investing the money received during the policy term.